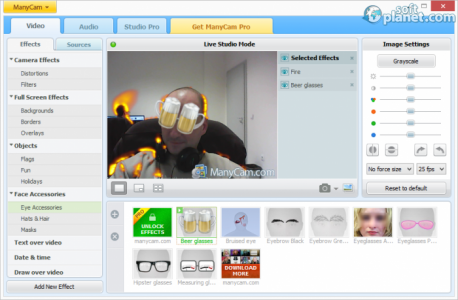 SoftPlanet makes it possible for everyone to get free ManyCam download directly from our servers. There is no registration needed for downloading. Video chat is one the most popular ways of communication that we use today. That's why you need a capable program that will be used for this goal. But there are not a lot of free programs that offer this function or they are a bit dull. This is not the case with ManyCam. The application makes the communication with video chat a pleasant and fun experience because it can add a lot of effects or it can adjust the communication in the way you would like it to be. All of this is offered in a free package that can be used without many limitations, but if you enjoy the application you can buy its Pro version for USD 49.95. The number of effects that you can add with ManyCam is staggering. You can switch on different distortions like Bulge, Fire, Flame, Matrix, Mirror, Snow, Square, Squeeze, Warp, Water and more. There are also filters that you can add including Alien, Black and White, Brush Art, Cartoonizer, Gray Lines, Old Movie, Red Contours, White Gradient, etc. The numbers of effects are filled with Backgrounds, Borders, Overlays, Flags, Fun, Holidays, Eye Accessories, Hats and Hair, Masks and all of these categories include a lot of different effects that can be added. 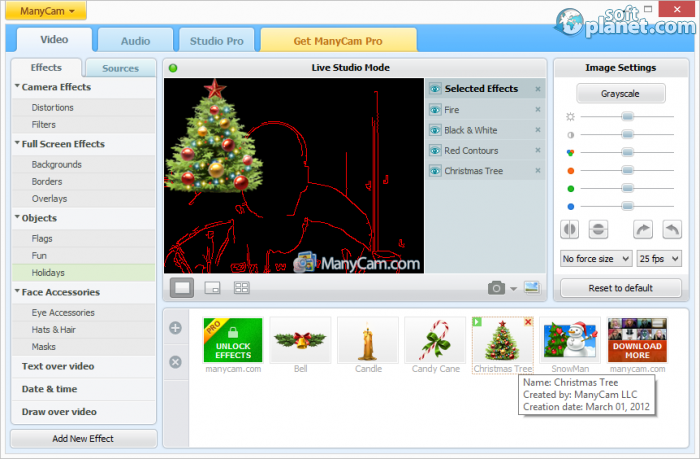 ManyCam has a tabbed interface with included drop-down menus. 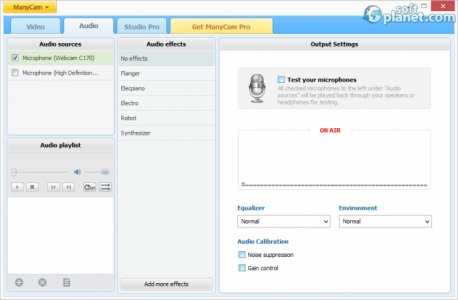 This helps the app to contain all the effects that it has and the tabbed menus are for the Video and Audio functions of the program. The only tabbed window that is unneeded is the one showing the Pro version of the app, which you can view, but of course you can't use unless you buy it. Otherwise the interface of the program is user friendly, because from the tabs you can easily access the most important utilities for the video and audio. For example, if you want to use video effects click on the Video tab, then on the Effects tab and you can choose one of the many effects that you have at your disposal. If you want you can view the source that you use from the Sources tab, where you have all the available Cameras, IP Cameras, Video Gallery, Image Gallery, Desktop, Blank image or Playlist. All the functions of the program work without any issues, with the only exception that in the free version you can use only one device at a time. For more you need the Pro edition of ManyCam. Still, for all the functions that are offered by the app the free version is quite capable. This is supported by the fact that you can also add audio effects which will make your voice sound like coming from a robot, a synthesizer, an electric piano or like Electro or Flangered voice. There's also the option to make the equalizer sound like Rock or Rap, or you can change the environment to room and bathroom. More functions are available in the paid version. ManyCam is a very fun application and we can recommend it if you want to have a program that will make you enjoy you video calls even more. You can create fun experience for your friends too, because they see all the changes that you make. Actually the changes are mainly for your friend's enjoyment, except if they don't use this program too, something that we recommend, because this will be the funniest conversion ever. Our security scan shows that ManyCam is clean from viruses. 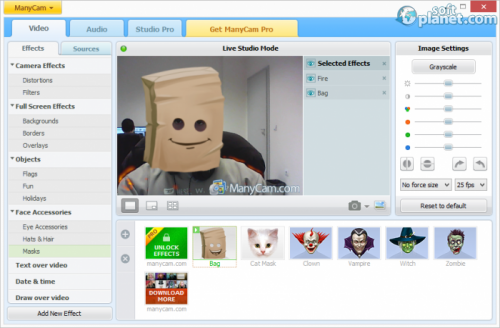 The current version of ManyCam has been scanned by our system, which contains 46 different anti-virus algorithms. That ensures that ManyCam 4.1.2 is 100% safe for your computer.